As I said in my recent article on Local SEO – 7 Step Guide to the Best Local SEO – 46% of all searches on Google are local. 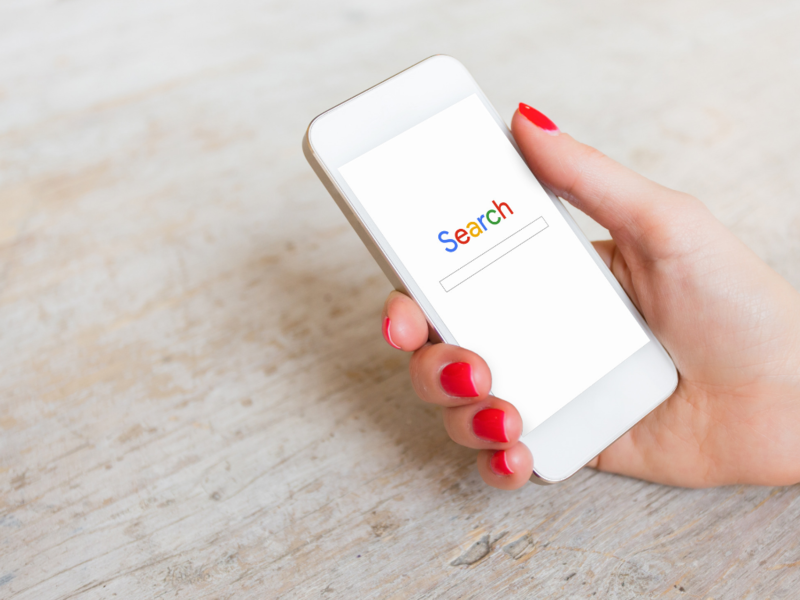 Local search is critical to your business and is only going to get more important as search and Google shift more towards mobile. What is this article about and who is it for? You may be asking why Hampshire? If your business is based in say, Surrey, that’s fine, this guide is also for you but I needed an example county. Seeing as I’m in Hampshire, that seemed like a good place to start. Who’s it for? Well, anybody that has a website and wants to understand how search, and in particular local search, works with Google. This will allow anyone to perform some basic search engine optimisation specifically for, in this case, SEO Hampshire. Your business is almost certainly in a town or city, let’s use Eastleigh as an example throughout this guide. No surprise, that’s where Web-Feet is based. Eastleigh is a town in Hampshire with a population of around 130,000, roughly 10% of the population of Hampshire – just to put things in perspective. If you are from much further afield and have no idea where I’m talking about, welcome! Hampshire is in the UK, on the South Coast of England. When you search for a product or service on Google, you will quite often get served up some ads There are at the top of the page, followed by what’s called the Local Pack. An example of which is below. In this case, there are two ads followed by the Local Pack. Underneath the local pack are the Google Organic Search Results. Now, see how I just searched for ‘landscaping services’ and not ‘landscaping services Eastleigh’, or ‘landscaping services near me’? Google is smart and I wasn’t even using my mobile. You can see that it has placed me on the map by way of a small blue dot just underneath where it says ‘Chandlers Ford’. Whatever device you are using, Google knows where you are. Or has a pretty good idea and gives you relevant search results. A few years ago, you would have had to have been more specific with your search queries. Now, you don’t need to be. In fact, you probably haven’t even noticed because most people have adapted to the new way of finding things online. If you provide Landscaping Services in Eastleigh you will want to be listed in the Local Pack. The main reason being that it’s below paid ads but above organic results. This is your first consideration with respect to Local Search. I’ve covered this in a bit more detail in my article 7 Step Guide to the Best Local SEO. To get straight to it with Google you can go to the Google My Business page. Here you will be able to complete the whole process or update your existing listing. Without covering the whole process, my advice would be to be as thorough as possible and make sure that your NAP (Name, Address and Phone number) are entirely consistent wherever they are listed. Google will get confused otherwise and you won’t get the full benefit of the listing. So now your Google My business is set up, let’s move on. Let’s say you are a landscaping business in Eastleigh and you’re listed in the Local Pack. That’s great, but Eastleigh isn’t that big a place and your business covers the whole of Hampshire. This actually presents your business with a bit of a challenge. Anyone searching Google will always be served up a business local to them in the Local Pack. 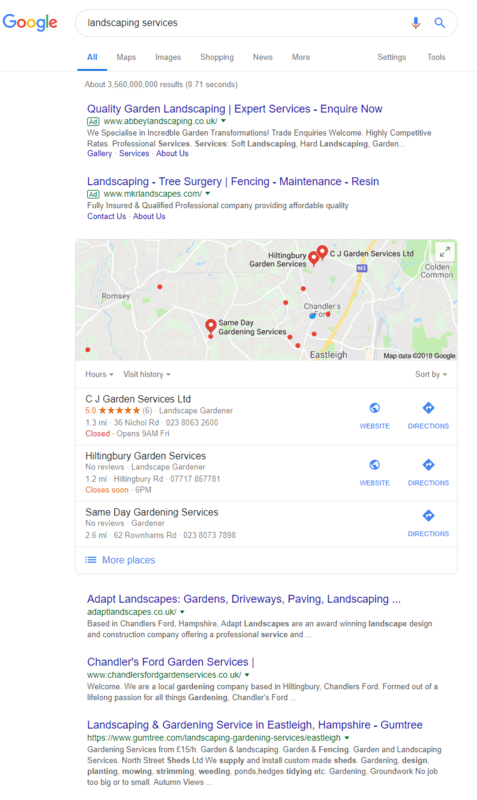 Someone doing the same search above in Southampton (a city just down the road from Eastleigh, population around 250,000), is going to find a landscaping business in Southampton, not Eastleigh. At least as far as the Local Pack results go. To cater for this scenario you can consider running Google Ads, this will allow you to target specific areas for search. This will ensure that your business is placed at the top of search for very specific search phrases and in specific geographic locations. Google Adwords is beyond the scope of this article however. Now whilst the Local Pack is important and you want to be listed here for local searches, underneath is where the organic search is. 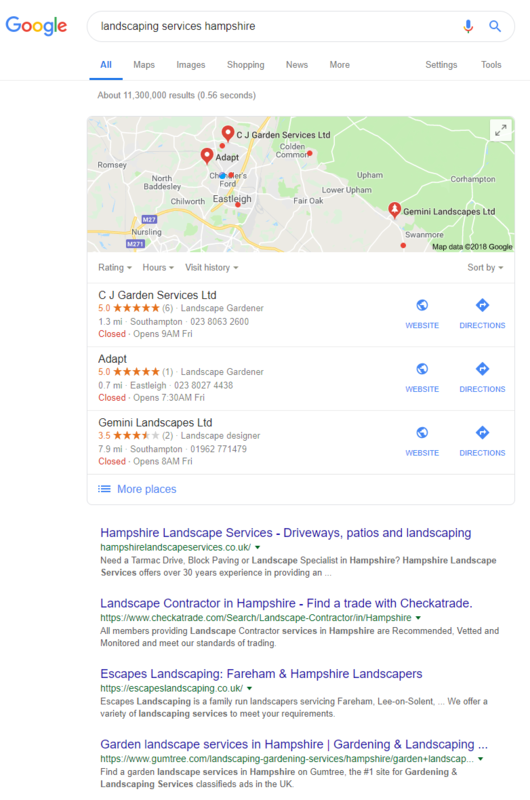 In order to rank well here, you need to optimise your website for, in this example, landscaping Eastleigh, landscaping services Southampton and landscaping services Hampshire. The temptation here is for businesses to build a page for each location they service but then go on to duplicate all the page content because it’s the same service, just in a different location. I would advise against this although you will still see this strategy in use. This approach is a bit dated and the problem with trying to unnaturally game the system is that Google makes the rules. Essentially, the more natural your approach to this the better. Always keep real people in mind. Don’t try and second guess what a computer thinks. If Google decideds clamps down on the use of this tactic, your entire online business is instantly compromised. You would need to make some significant changes to your website to address (sorry no pun intended) this. You need to be smarter than this because Google doesn’t like duplicate content and to be honest, neither should you. It’s just not adding any value to your visitors. You will see that the ads are now gone, which presents an opportunity perhaps but that’s not in the scope of this article. Let’s break this down a bit. The local pack is still showing services local to me, as expected. Looking down at the organic search results however and you will see two businesess that have made it clear to Google that they cover Hampshire. Equally, it’s clear to the person searching that they cover Hampshire. This is exactly what I’m talking about. It’s hard to see how if you carried out this search you’d not click on those two websites to investigate further. This is exactly the outcome you want as a business listed on Google. Basically, take every opportunity to say what you do and where you do it. This makes it clear to both your visitors and Google. That way, your website and business will be properly associated with all of these things. Google will list you accordingly and you should receive good quality click-throughs to inquire about your business. Each of these clicks is valuable and hopefully, you can convert them into a sale. Don’t forget that Page Title, Meta Description and other on-page areas are all places that you want to make your geographic business coverage clear. Going back to the example search above, you will see that Hampshire is mentioned in the Page Titles for both of the ranked pages in all four top positions. It’s not just this Local SEO factor that will get them this listing but it is a factor. More importantly, to the person looking at the search results, it’s clear to them that they are relevant to the search term they used. That brings this article to a close. I hope you found it useful. If you have any comments or questions please leave them in the comments below and I’ll get back to you.